In a critical situation or in case of an incident, seconds may be crucial to saving lives, preventing production downtimes or securing buildings and their technical infrastructure. New Voice MobiCall is an alerting, information, evacuation and conference system that enables fast and efficient transmission of information. In addition, systems and processes can be monitored. Due to the comprehensive interconnection between machines, appliances, sensors and responsible personnel, MobiCall enables the direct transmission of important process data, critical threshold values and technical and operational alarms. The versatile solution offers a wide range of interfaces, integrations and transmission channels and includes functions for personal safety, visualisation and conference management. Based on events, the solution can alert staff and external units in charge individually or by groups interactively through all known media using voice, text, image and video messages. 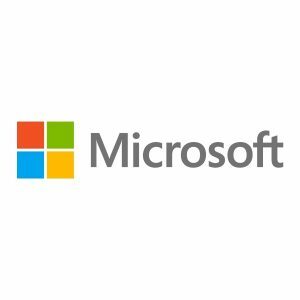 In the context of the seamless integration into Microsoft applications. New Voice supports all available alarm functionalities with intuitive usability for Microsoft solutions. Give your teams the freedom to be productive from anywhere while they receive important messages/information and alarms through MobiCall. 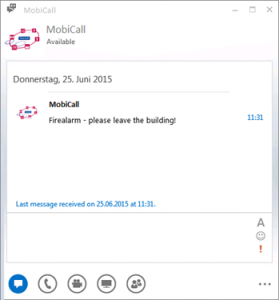 MobiCall is a flexible alarm management solution. Alarms triggered from external system such as fire systems, nurse call systems, potential-free signal or any other systems are routed to the MobiCall server which notifies the appropriate groups, persons and systems via different media such as telephones, email, GMS and 3rd party interfaces. MobiCall also allows to create and manage conferences. To reach the right persons at any moment, MobiCall access the presence status from each staff member (MobiCall access the presence information of the Microsoft Lync / Skype for Business accounts ). 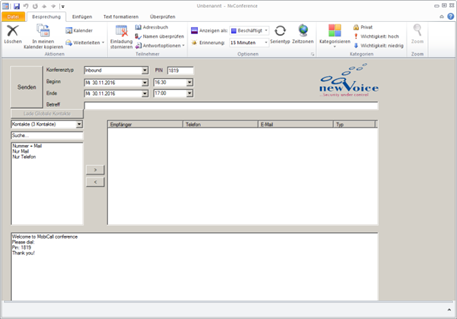 The New Voice Outlook Conference Plugin allows to trigger alarm (QuickLaunch), send alarms and messages, or to create conferences directly from your usual Outlook GUI. With the introduction of third generation, a new era in mobile communications was introduced. Constantly increasing demands on unlimited mobility and high requirements regarding intuitive handling and intelligent applications ask for innovative solutions in the area of alerting. 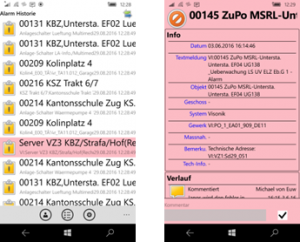 The mobile client is available for Windows 7 / 8.1 and also Windows 10 including Windows phone 8.1 und 10. Would you like a comprehensive list of available services or do you need more technical details? Please contact us and we will assist you with how MobiCall could assist you.